The Earthquake Research Institute at the University of Tokyo, the International Research Institute of Disaster Science (IRIDeS) at Tohoku University, the City of Kawasaki, and Fujitsu Limited have today signed a memorandum determining that they will collaborate on a project that advances the utilization of disaster prevention technologies and ICT, including artificial intelligence (AI) and supercomputers. The organizations will investigate technologies to predict tsunamis and take preemptive measures aimed at mitigating tsunami disaster risk in the Kawasaki coastal zone. The City of Kawasaki and Fujitsu signed a framework agreement aimed at promoting a sustainable community(1) in fiscal 2014, and this technology study is a part of those efforts, in collaboration with the Earthquake Research Institute and IRIDeS. In the future, the four organizations will also extend the results of this study from the coastal areas near Kawasaki to other regions, such as areas bordering the Nankai Trough, with the goal of contributing to the creation of sustainable communities that stand up well to disasters. Details of the tsunami disaster mitigation technology study will be introduced at the inaugural World Bosai Forum International Disaster and Risk Conference 2017(2) , which will be held in Sendai, Miyagi Prefecture on November 25-28, 2017. Since the Great East Japan Earthquake of 2011, Japan has rolled out infrastructure for offshore tsunami observations, and this infrastructure is being put to use to advance the development of a broad range of tsunami prediction methods. In Japan, with its diverse topographical features, there are significant differences among each region with regard to the degree of tsunami risk and level of urgency for evacuations in the case of a tsunami, and moreover, with the degree of difficulty in predicting tsunamis. For example, with a major earthquake in the Nankai Trough (figure 1), it is anticipated that there will be regions where a tsunami would hit within minutes following an earthquake, while it may take over an hour to reach Kawasaki or other parts inside Tokyo Bay. 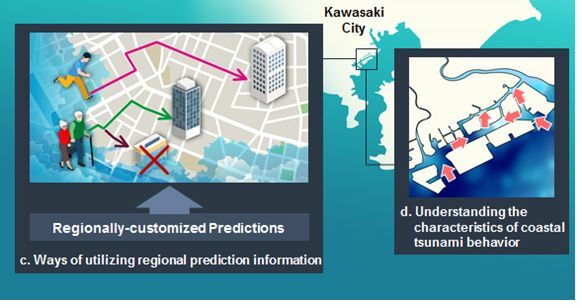 In order to more effectively implement measures to reduce disaster risk from a major tsunami that could occur in the future, a system needs to not only utilize tsunami predictions that look at the whole country, but also require regionally customized tsunami predictions that take into account the characteristics of each region. With this in mind, these organizations have agreed to work toward the investigation of practical and effective tsunami disaster mitigation measures tailored to the characteristics and needs of each region by taking full advantage of the latest ICT, such as with AI and supercomputers, in a collaborative framework of industry, government and academia. With the Kawasaki coastal zone as an area of focus, the organizations, including the Emergency Management Office of the City of Kawasaki, are exchanging views and conducting a study of technology that will be effective where disasters occur. In light of an earthquake and tsunami threat as envisaged by the Earthquake Research Institute, the companies will utilize fast and accurate tsunami flooding simulation technology(4) jointly developed by IRIDeS and Fujitsu Laboratories Ltd., and the tsunami evacuation simulation technology that models evacuation behavior, which is advanced by IRIDeS and the Fujitsu Research Institute. The organizations plan to primarily consider the following four areas. 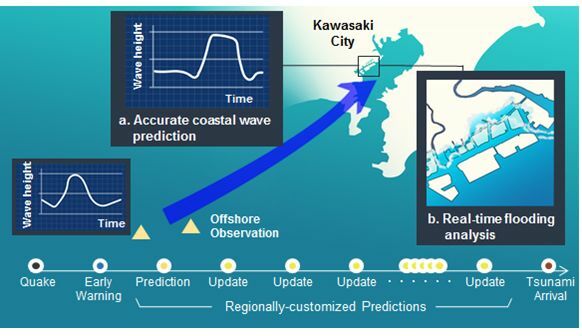 The organizations will study methods for accurately predicting the profile of a tsunami hitting the Kawasaki coastal zone, including wave height and arrival time, using progressively obtained observational data from distant offshore tsunami observation stations, studying their effectiveness in light of a variety of hypothetical earthquakes (figure 2). The organizations will build a simulation model to analyze tsunami flooding for the Kawasaki coastal zone at high resolution in real time, based on offshore observational data (figure 2). The organizations will evaluate the effect of disaster mitigation gained by using the regional tsunami prediction information described in a. and b. based on a simulation that models human behavior, investigating effective methods for how to utilize this information in advance (figure 3). 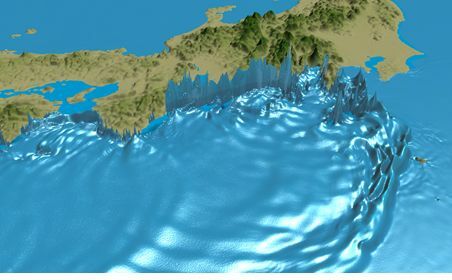 The organizations will work to gain a preemptive understanding of the complex behavior of a tsunami in the Kawasaki coastal zone, which has multiple man-made waterways, using simulations of a variety of possible tsunamis (figure 3). After conducting this technology study, the four organizations plan to consider issues including the uncertainty of predictions and consistency with tsunami early warning information from other organizations, with an eye towards the practical application of these technologies. Furthermore, they will contribute to the creation of effective regional disaster mitigation measures for possible future earthquakes and tsunamis by applying the results of this technology study of the Kawasaki coastal zone to other regions in the future, such as the Nankai Trough coastal region. Data from the Cabinet Office Investigative Commission on Modeling a Major Earthquake in the Nankai Trough was used for the simulation.